My favorite summer holiday is the Fourth of July. I love the family BBQ and picnics and these festive desserts you might want to make for the holiday! Surely one of these will be on your list for your dinner! Our neighborhood is gearing up for our fantastic fireworks display. We have a couple of large lakes that we can watch the fireworks from and that is so fun. The reflection is gorgeous (that's the photographer in me!) One of these treats, the white chocolate popcorn with the red and blue M & M's will be accompanying me! Our street has had a BBQ each Fourth and I am hoping it will happen again, although, I don't know of any plans for it. If so, that strawberry cobbler will have to make an appearance. 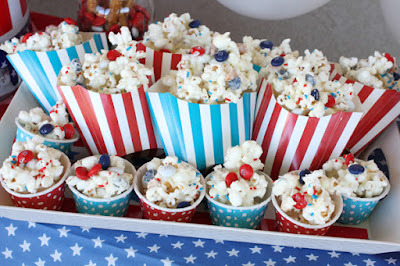 The Fourth of July neighborhood parade is coming up, too and I hope to have some little treats made up to throw to the kids! Which one do you want to make? Perfect timing. We are having a bunch of people over on Monday to celebrate the 4th and I am ALWAYS looking for new ideas. I want to try those Bomb Pop Shots!! These all look wonderful and I am sure you will have a great 4th of July. I live across the ocean so wont be celebrating that day but hope you have a wonderful and delicious time with these amazing recipes. The cotton candy ice-cream cones. I mean, stop right there. Totally calling (no...screaming!) my name! And the popcorn is totally fun too. Lots to make it a fab celebration! The white chocolate popcorn with mnms sounds so yummy. I need to break out some red white and blue snacks this week while we are on vacation. My family would be thrilled! I plan to control my intake.. but my goodness..with such delicious recipes you've shared here I'm afraid I have to postpone my diet. Strawberry Trifle Dessert is the one I'd love to make. 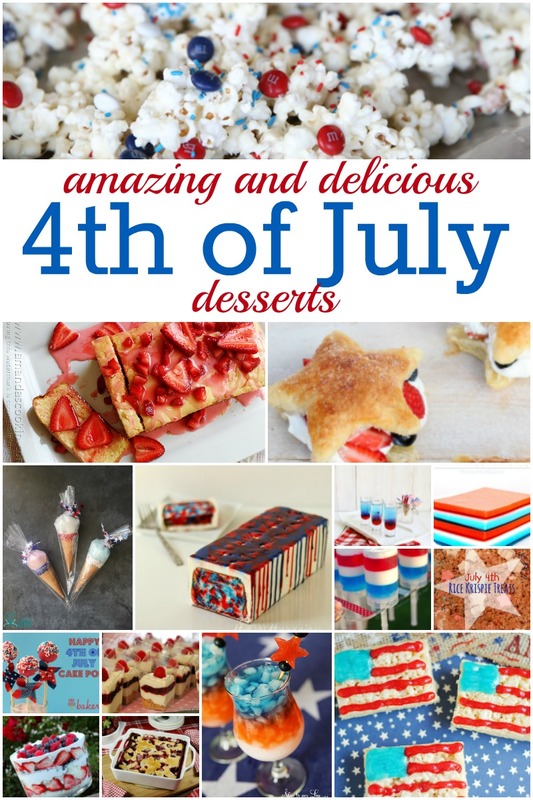 These look so amazing, I needed a good 4th of July dessert idea and I plan to use a couple of these! Yum!! All these look so good! And I have a party coming up so this will come in handy. Fourth of July treats are some of my absolute favorites! I love how patriotic they are. There never seems to be an end to people's creativity! I think the push up pops or tie-dye cake are going to be the ones I try. The fourth of July is my absolute favorite holiday! I am going to have to make some of these super fun treats! These all look so amazing! I was planning on spending today to make a menu for the holiday weekend and this looks like a great place to start. We love making desserts for 4th of July! I am trying to decide on what red, white and blue treats will we make for the weekend right now actually! Great ideas in this round up! These are the perfect desserts for the Fourth of July. Not only is it an extremely patriotic holiday but it allows you to have a lot of fun with the family. These look super good. I can't wait to try one of these. I'm going to make one of these for my sister's gathering. YUM!! Lots of delicious desserts happening here. I am in love. Fourth of July is one of my favorite holidays as well. You've rounded up such amazing recipes. I definitely have my eye on the Fourth of July Popcorn. Looks delicious! This is such a fun idea! I never seem to do themes around holidays, except Christmas of course. But, we have a lot of family here this weekend, so maybe I will branch out!